The market in gothic ivories has reached a crossroads. These statues and relief panels may be devotional or secular objects, and are carved mostly from African elephant ivory (though examples fashioned from walrus tusk may also be seen). The majority originate in France and adjacent parts of Europe, and date from the mid 13th to the mid 16th century. In many ways the field is on a high, with a host of recent books and international conferences – from London to Kalamazoo, Michigan – shedding new light on this traditionally obscure field. 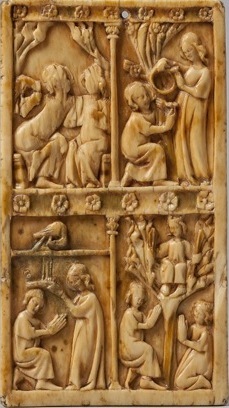 The Gothic Ivories Project founded by the Courtauld Institute of Art in 2008 is flourishing, with a publicly accessible online database of known ivories, and last year saw the publication of John Lowden’s catalogue raisonné of the medieval and later ivories in the Courtauld collection. 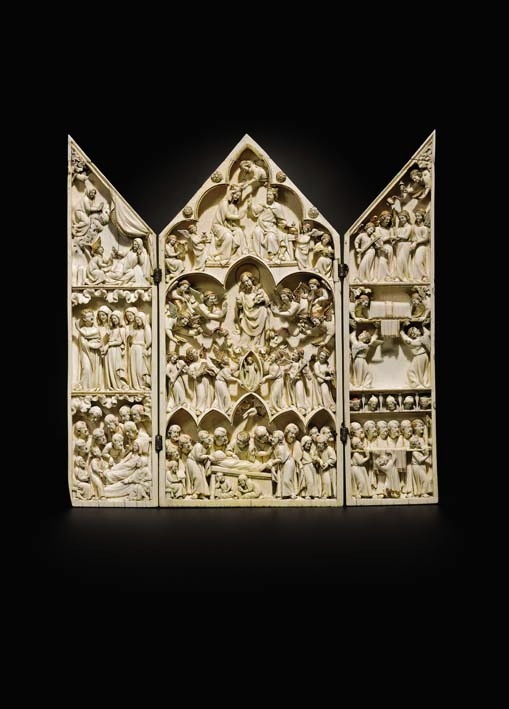 Another publishing milestone is Medieval Ivory Carvings 1200–1550 by Paul Williamson and Glyn Davies, the first comprehensive catalogue of the ivory holdings of the Victoria and Albert Museum since 1929. It hit shelves on 1 July and has, says London dealer Sam Fogg, ‘transformed the subject’. Meanwhile, as European governments have so far resisted any similar moves, the market on this side of the Atlantic is more optimistic. Fogg comments: ‘There have been some wonderful ivories on the market in the last 10 years which has helped to push up prices.’ He states: ‘The value is really to do with the quality of the artist, but of course scenes of chivalry, lovers or seduction are very desirable, though very rare.’ He adds: ‘There have been many fakes sold at auction and vice versa, so authenticity is an issue. However, the state of research is now at such a stage that the collector can buy with confidence from a knowledgeable dealer.’ He currently has one fine leaf from a French diptych depicting the Descent from the Cross and the Flagellation, dated around 1300 (£40,000). Jan Finch of London-based Finch & Co, which has dealt in gothic ivories for 25 years, reports that ‘early French Madonnas are particularly sought after’, with intact diptychs and triptychs, created for ladies’ private devotion, also highly desirable. The extremes of price between the best and the rest are reflected by the fact that its most recent sale of part of a diptych from the 14th century depicting the Crucifixion sold for the relatively modest sum of £9,000. Erik Bijzet, meanwhile, Sotheby’s European sculpture and works of art specialist, suggests that the most spectacular pieces date from between 1250 and 1320 – when ‘artists were experimenting with the gothic style’. He observes that where 20 years ago scholars dismissed ivories from anywhere outside the Île-de-France, today – while a gothic piece from Paris might still top the market – those from other regions, such as Meuse or northern France, are also highly appreciated. He notes that besides a handful of scholarly collectors, there are newer ‘treasure hunters’ who might buy an exceptional example. Scale, when you are dealing with objects limited by the dimensions of the original material, is a significant factor in price, as is provenance, given universal restrictions on trade in African elephant ivory, agreed in 1989 under the Convention on International Trade in Endangered Species. Luc De Backker of Belgian dealership De Backker Medieval Art reports that limited supply is the major problem. ‘It’s not easy anymore to find medieval ivories of a refined quality on the market – especially not for a reasonable price.’ There is however strong demand. ‘The often very detailed decorations of the ivory objects, mostly in miniature, appeal to a lot of people, even if they are not interested in medieval art at all.’ He also notes the extension of the market beyond its traditional base in Europe and North America to China. ‘Although we Europeans have been collecting Chinese art for centuries, it still feels a bit strange that the Chinese collector also appreciates our Western medieval art.’ That said, the entry of the Chinese into the market is not altogether surprising; ivory is, after all, De Backker comments, ‘part of their artistic heritage’. While he observed the absence of Americans on his stand at Masterpiece London, he does not think this will have ‘any impact on the prices for ivory carvings in general’. He is confidently offering Nursing Madonna – Calvary (c. 1320) for £120,000, a very fine diptych likely from its workmanship to be from Paris. As the Art Fund appeals to save Wedgwood, will anything be done to secure one of Turner’s major works for a national collection when it goes up for sale at Sotheby’s?